The most common question asked about the 2004 Olympics was "Do you think Greece can pull it off?" Well we all know now that they did and not only that, they even used ancient Olympia as one of the venues. Maybe you saw it on TV? The original Olympics began as a small regional festival in the 11th century, which was dedicated to the God Zeus. 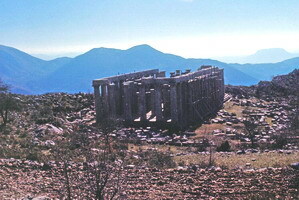 But the origins of the town itself are Mycenaean who worshipped the Goddess Rhea, sister of Cronus and father of Zeus. If you know your Mythology you may remember that Cronus was told that he would be dethroned by his own children and he devoured five of the sons Rhea had given birth to. When Zeus was born she gave a rock to Cronus and he ate that instead. Zeus survived and later dispatched his father to the underworld and Zeus became top God and founder of the Olympic games.The first Olympic games were held in 776 BC and reached their height of popularity in 576 BC. The festival was open to only Greek born men but later Romans were allowed to compete most likely because they were running the Greek world by then. Slaves and women were not even allowed to be spectators and women caught sneaking in were thrown off a cliff. The events included foot races, wrestling, discus, javelin, long-jump, horse and chariot racing, and a type of boxing called pancratium. There were not only atheletic events but also writing, poetry and history readings, plus business transactions and treaties were made between leaders of city-states. There was no television so unlike modern Olympics, spectators were able to see all the events and not just the ones the Americans were in and had a good chance of winning. The games were banned in 426 by the emperor Theodosius II because they were pagan, and the temples were destroyed. The Olympics were officially revived in 1896 in Athens but actually the games had been started with less fanfare even earlier. The first modern international Olympic Games held in Athens at Platia Kotzia, then called Ludouvikou or Ludvig Square, in 1859, sponsored by Evangelis Zappas. 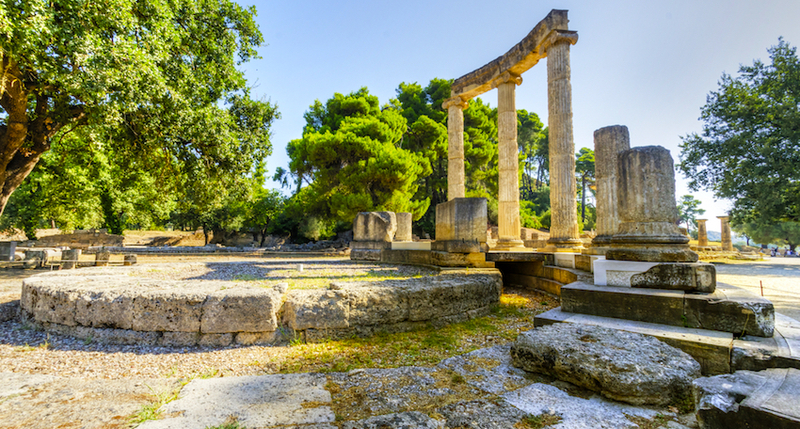 Olympia is one of the most popular destinations for tourists in Greece. Even cruise ships dock at the nearby port of Katakolo and put people on buses to visit the site. The village of Olympia itself is a collection of tourist shops, cafes, restaurants and a Historical Museum of the Olympic Games. As in most overly touristed places in Greece finding a restaurant is easy though finding a good restaurant is not. My friends at Lonely Planet suggest the Taverna Praxitelous, next to the police station and the Klimitaria, on the edge of town on the road to Pyrgos. We liked the Taverna Bacchus, owned by the friendly Dimitris Zapantis, in the nearby village of Miraka on the road to Tripolis. Just follow the signs for Ancient Pisa and it is a stone building on your right at the top of the hill. In fact it was recommended by George The Famous Taxi Driver because he takes his clients there. Because of the destruction of the site by Theodosius and several earthquakes, there is not much left in the way of buildings besides foundations, steps and columns but these are impressive and are in a beautiful setting near the Kladeos river. The area is called The Altis which means the area sacred to Zeus and the reason there is anything left is because the flooding of the river buried it until 1875 when archaeologists rediscovered it. The most outstanding building is the 5th Century Temple of Zeus, built by Livon, which contained the 12 meter high statue by Phideas, one of the seven wonders of the ancient world, which was removed to Constantinople by Theodocious and destroyed in a fire. The stadium which could seat at least 20,000 people and was the largest of its kind. 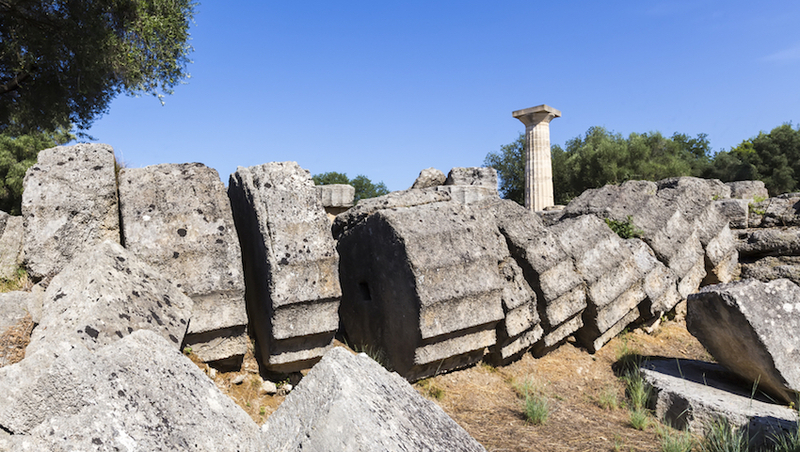 The Temple of Hera is where the Olympic flame is lit from the sun and then taken by runners to light the torch wherever the games are being held, a tradition which dates all the way back to 1936AD. Even today you will notice runners using the area for fun and for practice. The museum is across the road and contains the 4th Century BC statue of Hermes by Praxiteles, familiar to anyone who has taken art history, plus a number of other finds from the excavations including the Nike of Victory by Paeonios. According to Olympic legend she used to come down from the sky to hand a palm leaf to the winners. The entire archaeological site of Olympia won't make you stare in awe and marvel at the ancient architecture however it is a beautiful place to visit and unlike most archaeological sites in Greece which are exposed to the sun and surrounded by vegetation that barely reaches your ankles, Olympia is shaded by tall trees and walking through the ruins can be a peaceful and profound experience. Olympia is a place you can visit any time of year and if you can come here when the rest of the tourists are gone you will find it even more enjoyable. Many people seem to arrive on tour buses which can be arranged by any travel agency. 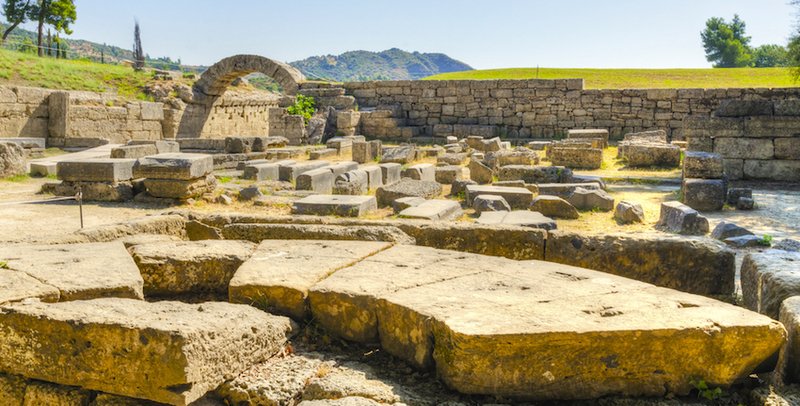 Fantasy Travel's 3-Day Classical Tour and 4-Day Classical Tour include Olympia as well as Delphi, Meteora and the Argolis. The 7-Day Grand Tour also includes Olympia along with just about every other important site on the mainland. For those using George the Famous Taxi Driver, keep in mind that it is a 5 hour drive from Athens and is therefore an overnight trip. But this can be done in combination with Delphi, Kalavrita or even Nafplio and the Argolis. There are five trains a day to Pyrgos, half an hour away, and from there six trains a day to Athens and eight trains a day to Patras. For those who are coming from Katakolon on a cruise ship there are usually trains which are coordinated to the arrival and departure of the ship. The trip takes about 45 minutes and costs about 10 euros round-trip which will save you money if your other option is taking the tour the cruise companies offer. You can also take the bus from Katakolon but you will have to change at Pyrgos. If you are on a cruise your best option is to do a tour with Elena Agelli. If you are coming from Italy and have your heart set on Olympia take a bus or train to Pyrgos and then to Olympia. There are four buses a day from Olympia to Athens. We stayed at the excellent Hotel Europa(photo) which gets exceptional reviews. The hotel is located on a wooded hill overlooking the town of Olympia and the beautiful valley to the west. It has a swimming pool, a large dining area and beautiful rooms with televisions with many channels. Expect to pay between 80 and 90 euros for a double and 120 for a family room during the summer. For about the same price the Olympion Asty Hotel provides fantastic views of the area from its lovely outdoor pool and its spacious accommodation offers free wireless internet access. 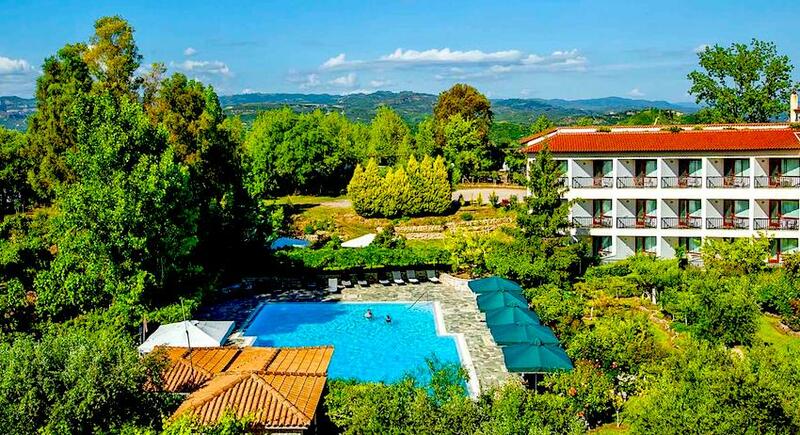 Just 15 minutes walk away from the sacred site of Ancient Olympia, the charming Hotel Pelops offers quality rooms, complete with orthopaedic mattresses, for a comfortable stay in a peaceful area and at affordable rates. The friendly, family-run Hotel Kronion in Olympia was renovated in 2008 and offers tastefully decorated rooms equipped with modern comfort, providing an ideal destination for guests seeking quality accommodation and convenience with doubles going for about 55 euros. Conveniently located in the heart of Ancient Olympia, next to the train station, Hotel Hercules combines a friendly atmosphere and great-value accommodation for your comfort with double rooms at about 50 euros. The best way to visit Olympia is either doing a private tour with George the Famous Taxi Driver, or else doing with a group such as Fantasy Travel's 3-Day Classical Tour and 4-Day Classical Tour which include Olympia as well as Delphi, Meteora and the Argolis. The 7-Day Grand Tour also includes Olympia along with just about every other important site on the mainland. 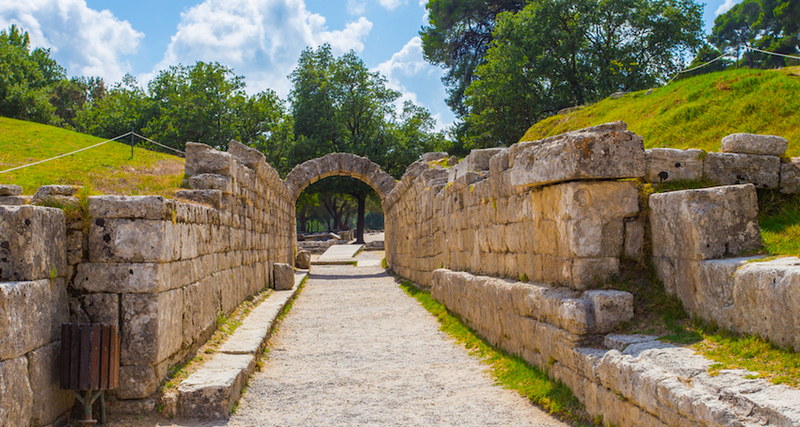 If you are on a cruise or you have come to Olympia on your own and need a guide to tour the archaeological site and the museum your best option is to do a tour with Elena Agelli. Be sure to see my Photos of the Peloponessos for photos of Olympia and my Guide to the Peloponessos for more places to visit in the area.